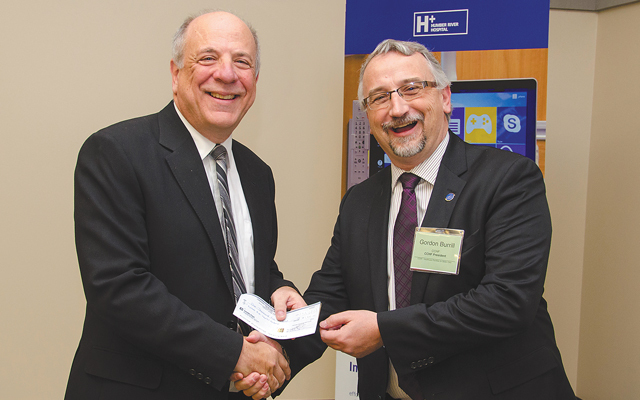 TORONTO – When planning what has become North America’s most automated hospital, the management team at Humber River Regional Hospital would have been quite happy to emulate another hospital that had put all the pieces together. That would have saved a lot of time and effort, but it turned out that nobody had done it yet – so they decided to create the world’s first ‘digital hospital’. Dr. Devlin and his team set out to do it themselves. In the process, they decided to borrow the best practices from around the world, including some from other industries. Because the facility would be much larger than the older one it replaced, saving steps for staff was a big issue. For example, it went from Emergency Department space of 21,000 square feet to 46,000 square feet, and the OR space nearly tripled to 29,000 square feet. Overall, the bright, beautifully designed building is 1.7-million square feet – with a long, patient drop-off area that resembles an airport terminal. “We did a study and found that in the previous building, a nurse walked 5.4 kilometers in a 12 hour shift,” said Barb Collins, VP of operations. “We projected the nurse would walk 11.6 kilometers in the new building,” she added, unless step-saving measures were taken. Collins and Dr. Devlin conducted an hour-and-a-half long presentation on the new ‘superhospital’ at the Design for Technology Innovations conference in December, held at Humber River Hospital and organized by the Canadian Centre for Healthcare Facilities. One of the most useful ‘step-saving’ ideas has been the deployment of automated guided vehicles – motorized platforms on wheels with computerized-brains, able to navigate hallways, open and close elevators, warn people to stand back, and to let staff know when they’ve delivered their payloads. The AGVs, for example, are extremely useful for delivering medications (except for narcotics, which are tightly controlled). Collins noted it’s the first time the vehicles have been used in a hospital in North America. The idea came from Norway, where AGVs are already used to boost the efficiency of healthcare facilities. Many of the processes in the Humber River Hospital have been completely re-designed, with heavy usage of electronic systems to speed-up workflow and improve patient safety and satisfaction. The lab workflow is a case in point. Previously, orders were faxed to the lab to start the process. Now, orders are sent by computer to the lab, which dispatches a technician with a cart to the bedside. The cart contains tubes for samples and a barcode printer –labels can be printed right at the bedside and attached to the tubes, after blood is drawn. The samples can be sent quickly to the lab via a pneumatic tube system. The new method has reduced turnaround time from several hours to just one hour – from order to result. And because of the barcoding, there are fewer mistakes made with samples. Similarly, medication orders are sent to the central pharmacy electronically. A robotic system picks and packages medications into envelopes that are organized on a ring; each envelope is barcoded, as is the entire ring. The rings are packaged into trays and bins, and sent by the automated guided vehicles to the appropriate nursing stations. They are unpacked, sorted into carts, and delivered to patients at the bedside, where the barcoding is used by nurses to check that the right patient is getting the right med at the right time. Vital signs are transmitted from bedside monitors right into the Meditech electronic health record, again eliminating the need for paper, re-keying data, and the chance of transcription errors. The systems at Humber are collectively referred to as “ICAT”, short for Information, Communication, Automation and Technology. Clinical information systems, fire and safety alarms, bedside terminals, nurse call systems and wayfinding systems can all be monitored from a centralized data centre – something that looks like Captain Kirk’s command centre on the Starship Enterprise. They include intelligent bedside terminals (IBTs) in each of the patient rooms that provide a wide range of functions – access to the Internet, menu ordering, educational videos, and access to the patient’s own medical records. Dr. Devlin commented that giving patients the ability to view their records gives them the respect they deserve, and also empowers them by supplying the means to take charge of their own health. Humber has created a patient portal that allows patients to access their records while in hospital and from the comfort of their homes. The bedside terminals can also be used by clinicians to call up patient records and enter information, or to explain X-rays or lab results to patients. Communication is often a pain point in hospitals, with clinicians struggling to connect with each other and with patients. To improve communications, Humber worked with wireless systems vendor Ascom, and integrator ThoughtWire, to create an advanced wireless phone. Designed primarily for the nursing staff, who log into one of the devices and carry it around each day, physicians are now asking for them, too, Collins said. The Ascom phones not only take calls, but show bedside alerts and hospital alarms, and act as a nurse call system from patients. Equipped with cameras and screens, they even enable videoconferencing with patients at the bedside, using the patient’s bedside terminal. If a nurse has forgotten the barcode reader, he or she can use the phone to check medications or lab samples, as it has a barcode reader built in. Nurses can closely monitor cardiac patients from anywhere in the hospital, since the phones display cardiac rhythm strips. Finding staff, patients and equipment in the hospital is much easier, thanks to the new real-time locating system. Small tags are attached to staff, patients and most pieces of equipment to find their position in the hospital – something that’s displayed on the computer system. “We’re not tracking staff, but if we need to know where people are, we can find them,” said Collins. It’s very useful for finding equipment – which has a habit of going missing in hospitals. “You want to find a wheel chair?” asked Collins. “It’s easy to do with the RTLS.” And when a porter is needed to pick up a patient, it’s more efficient to find one who is nearby, rather than at the other end of the building. “That saves time and steps,” noted Collins. The system also has a security function for staff, which can be used in cases of hostile or dangerous patients and visitors. There are buttons on the back of the tags worn by staff, which send an alert to bring security to the scene.